Viola renifolia is a boreal North American species. 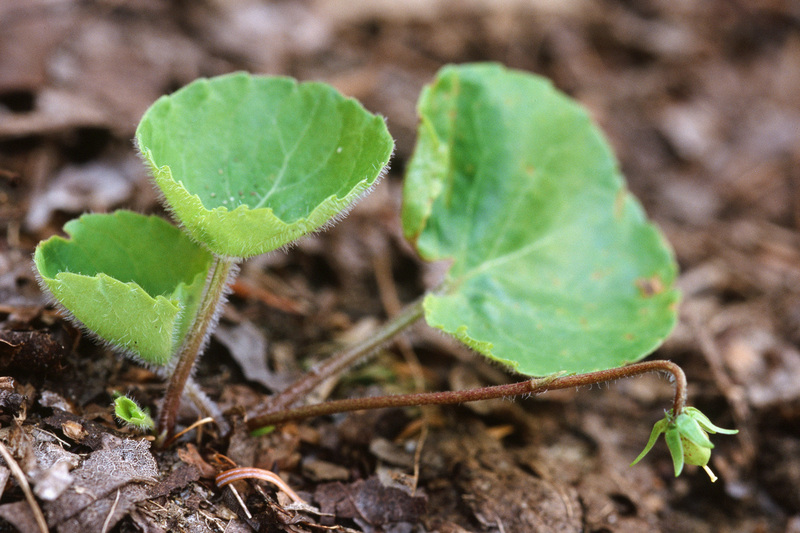 The absence of stolons and the spreading wide kidney-shaped leaves with wavy margins will distinguish this species from other white stemless violets. It does not occur in large colonies but as scattered individual plants usually growing on limestone. Occuring throughout Canada, its range spreads south in cold habitats especially at higher altitudes. Generally it is uncommon, though in some areas it may be locally common, for example, north and west of Lake Superior and in central and eastern British Columbia. White flowered Viola palustris var. brevipes also occurs in the latter location in similar wet subalpine sites. 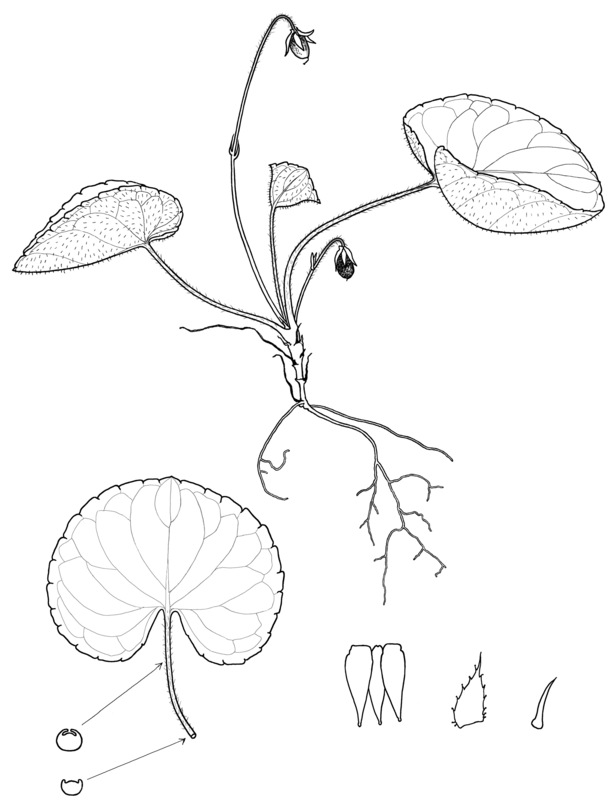 The vertical rhizome may be slender in young plants growing thicker and scaly with age, 2–4 mm wide, rarely branching. Stolons are very rarely produced, but if present, the bear cleistogamous flowers, indicating that the ancestral presence of stolons has become lost isolating this species as an outlier in the stemless stoloniferous group. Leaf blades are wider than long, reniform to orbicular in shape, 1.5–8 cm wide at maturity, the basal lobes are cordate; the margins crenate and undulate. Early leaves have a rounded tip and shallow sinus, later leaves have a blunt obtuse tip and deeper sinus. The leaves are shiny, dark on upper surface and sometimes concave but paler on lower surface. They are glabrous to hairy on both surfaces, young leaves more likely to be pubescent but becoming glabrous with age. Usually the upper leaf surface is glabrous, the underside with long fine glistening silky hairs, especially on the veins. Leaf margins are decurrent at the top of the petiole and infolded, with the same fine hairs as on the lower leaf. Petioles green or lightly spotted purple, 3–15 cm long. The peduncles are green or spotted purple, hairy or smooth; bracteoles are triangular, straight and closely held parallel to the peduncle, 3 mm long. White flowers are few, held above the low spreading kidney-shaped leaves. The lateral and lower petals are veined red-purple, particularly the lower petal, no green coloring in the central throat. The two two top petals usually turn backwards at maturity, the inside of the lateral petals is beardless, the lowest petal rounded to very slightly notched at the end; the petal spur is short, rounded, to 1.5 mm long. Flowers bloom in mid to late May and early June, with a honey-like perfume. Reddish-purple spotted seed pods have reflexed sepals. Both chasmogamous and cleistogamous flowers are produced, the latter on short prostrate peduncles. 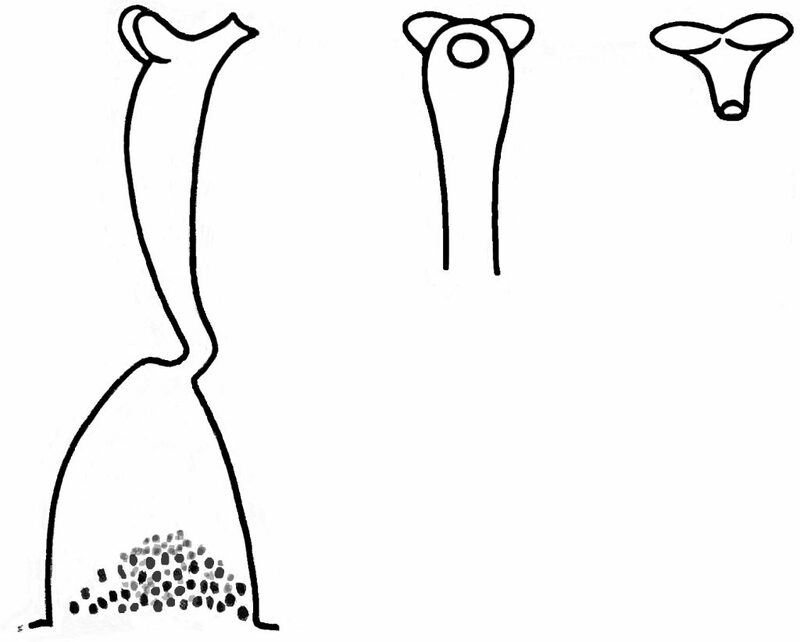 Pods are ellipsoid to nearly globular, 4–5 mm long, rounder and fatter than those of V. pallens. Seeds light to mid-brown, mottled with slightly darker brown, 2.0-2.4 mm long x 1.1 mm wide. 2N=4x=24. V. renifolia usually grows in alkaline soil, very rich in humus, in cool climates in moist woodlands and marshes or near swamps or creeks. From close to sea level in the far north to 2800 m (9200 ft) in montane and subalpine zones, it is nearly always associated with coniferous forests of firs, hemlock, spruce or white cedar, but occasionally in mixed deciduous forests of birch, oak, poplar or willow species. Viola selkirkii is often found with Viola renifolia, and in the northeast V. labradorica and V. adunca subsp. minor are also companion species. It ranges across North America from Labrador and Newfoundland to southern Alaska, British Columbia and northern Washington. Found as far north as the wooded regions of Hudson Bay in Ontario, it continues south to New England, New York, the Upper Peninsula of Michigan, Wisconsin, Minnesota, and eastern Iowa, all areas once covered by glaciers. In Pennsylvania it is extinct. It grows to high elevations in the Rocky Mountain States of Colorado, Montana, Wyoming and South Dakota. Viola renifolia A. Gray, Proc. Amer. Acad. Arts viii, 288. 1870. (syn. Viola renifolia Gray var. Brainerdii (Greene) Fern., Rhodora 14: 88. 1912; Viola brainerdii Greene, Pittonia 5: 89. 1902). 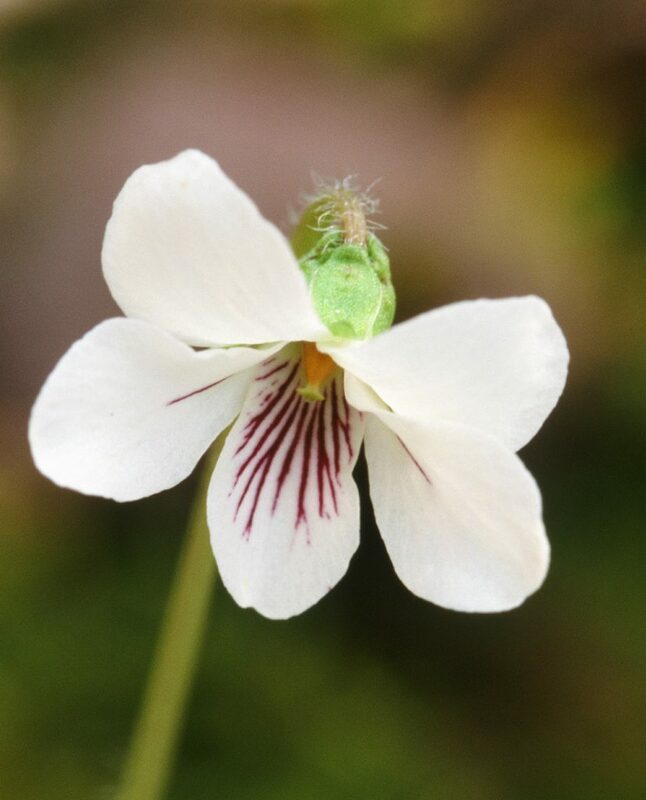 Viola renifolia was distinguished by Dr. Gray in 1870 from the small white flowered stemless violets originally grouped under the name Viola blanda. In 1902, Fernald described as var. brainerdii (Greene) plants that are glabrous or nearly so, especially on the upper leaf surface. In a regional analysis of pubescence types Russell (1965) concluded that they were not sufficently distinct morpologially or geographically to merit nomenclatural recognition. All grow closely intermixed without apparent isolation or microgeographic distributional differences. North of Thunder Bay in western Ontario, I collected material of a hybrid between V. renifolia and V. pallens, both of which grew in close vicinity. Results of chromosome analysis by Marcussen (2010, pers. comm.) showed that part of the genome was indeed from V. pallens. The hybrid plant was larger than V. renifolia, more vigorous and with thicker leaves. The bracteoles were short, red, and projecting outwards from the peduncle, like those of Viola pallens. Russell (1965) also reported possible hybridization and resultant introgression between V. renifolia, V. blanda (V. incognita) and V. pallens in Minnesota. The name‘renifolia’ means kidney-shaped leaves, the Greek word ‘nephrophylla’ has the same meaning. Previous Post Viola primulifolia L.